Ants, roaches, bed bugs, fleas — just the utterance of these words can send chills up the spine of some people. This is often for good reason, and if you find yourself in this group and think that you are in need of pest control, go ahead and save yourself the panic attack, and call Lawn Control Center today. 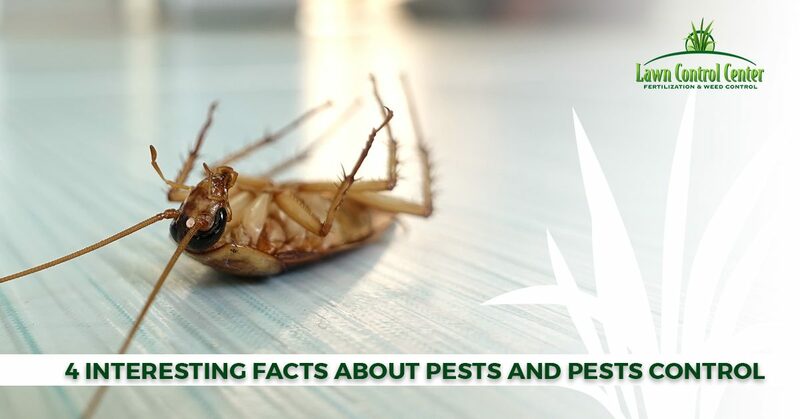 If, however, you enjoy learning about these common pests, read on to learn about some interesting pest facts. If you are in the Cleveland or Columbus area and are in need of pest control or lawn care services, give us a call at 888-833-6205 or fill out this form. Read on for four interesting facts about common household pests. Believe it or not, all of those black ants that appear in our kitchens during the spring and summer are actually unable to consume solid food. This is partly because ants have very narrow waists, or petioles, that make it impossible for their digestive systems to process solid foods. So how do ants get around this? The first strategy is to take the food to their larvae, which is where the ant colony will apply an enzyme that breaks down the solid food into a liquid. Other ants will regurgitate the solid food in liquid food, allowing adults to eat it. Additionally, ants also have mouths that are designed to function like a strainer or colander that keeps anything too big to digest out. There is perhaps no other stat on this list that better supports the argument that as soon as you spot a bed bug, it’s time to call your local pest control. According to this University of Minnesota study, newly born bed bugs can survive without food (blood) for up to several months. How long exactly they can survive depends on their activity (the more sedentary, the longer they can survive) and on the temperature (the cooler the temperatures, the more energy the bed bugs will have to expend to stay warm). German coaches have a maturation period of around 60 days, after which point they can reproduce. Mice, on the other hand, are able to begin breeding in as little as six weeks. Although this is true, female mice are not as prolific as cockroaches. For instance, a female German cockroach can hatch between 38 to 48 eggs at a time, whereas a common house mouse can only produce 14 babies — however, on average, this number is typically between six to eight. Regardless, the presence of mice or cockroaches in your home is not a good thing. If you need pest control help, contact your local exterminators today. Yep, you read that right. According to this Penn State College of Agricultural Sciences research, cockroaches can produce over 10,000 descendants in just a year’s time. This is assuming that a German cockroach is responsible for producing two generations per year. Another interesting tidbit about cockroaches: they have been on this planet for over 300 million years. To control cockroaches, bed bugs, ants, ticks, mice, and other common household pests, it’s crucial to perform regular inspections on your home, alert pest control experts when you notice any issues, and take proactive measures, like perimeter pest control, to prevent infestation. If you are in Cuyahoga, Medina, Lorain, Franklin, Delaware, Fairfield, Union, or anywhere else in our service area, contact us today to get a free quote or to schedule your pest control services.